Let’s face it. We love what we teach a lot more than our students do. I taught American History, and what I found was that as much as I was excited about what happened during the American Revolution, my 8th graders really didn’t care that much. They were more interested in what was on TV the night before or their latest boy/girl drama. This was a pretty tough realization at first. I had a hard time believing that my students were not as excited about my curriculum as I was. Some students even were getting bored in my class. That was really tough to take. I never wanted to be the “boring” teacher. After a while, however, I learned one of the best strategies to keep boredom out of my classroom, in spite of my curriculum. It’s all about finding that emotional connection. How do we connect our kids emotionally to the curriculum? That’s where my Boring-Lesson-Buster Formula comes in. Most teachers know how to teach the topic. They pull out the textbook, go over vocabulary, offer examples, give students opportunities for independent practice, then assess their understanding in one way or another. It’s basic teaching, and it’s what happens in most classrooms. It can also be boring for students. Students can’t learn when they’re bored. What’s worse is that when students are bored, they will look for ways to “un-bore” themselves, and that’s bad. So, how do we keep our curriculum from being boring? We need to connect it to the emotions of our students. We need a formula. Your goal is to teach the reasons behind the Colonies’ decision to declare independence. To me, that’s pretty interesting stuff, but to an 8th grader, it really doesn’t rank that high in their list of interesting things to focus on. So, before you start the lesson, you follow the formula by first asking a question. The questions should be one relate to the topic, of course, and one that will cause students to have one of two emotions – happy or mad. Then, after having them think about that for a while, you tell them to spend a couple minutes sharing their answers with a shoulder partner. That’s the second part of the formula. This is where you’ll see the kids really start getting excited. That’s a good thing. You’ve begun to get their emotions activated, and things might get a little crazy, so make sure you have a way to get their attention back to you. I used to use a count down strategy. (“Alright let’s come back in 5…4…3…2…1). Once you have their attention back, then you implement the last step. You ask for volunteers to share their story with the class. A few students will take turns sharing their stories, and you’ll notice that everyone will be paying attention. Here is where you’ll also get some great stories that you can use in your lesson. You can compare one of your students’ stories with the conflict between the Colonies and Britain back in the 1770’s. When I used this example, I also found it a good place to share some advice on how to respond to parents when their actions seem unfair. Once you’ve completed the formula, then you can begin teaching about the content. The point is to use this formula to make an emotional connection to the curriculum. When you do this, your students will not only stay engaged, but they will retain this information better, and it will place your lesson a little higher on your students’ interest list. This works for almost any lesson you may teach. The challenge is coming up with the right emotion-inducing question, but you’ll get good at it once you practice a little. Most importantly, you’ll find that your students will be more engaged and interested in your lesson and your class. You might even tell the class a story from your own childhood. Kids love this. They get to see you as a real person and not just the teacher. Go ahead and give it a try. 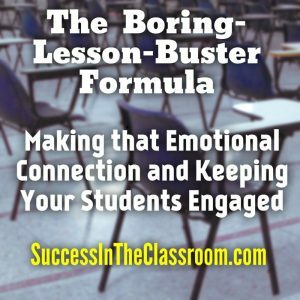 Use the Boring-Lesson-Buster Formula when you start your next unit. I would love to hear how it went. Feel free to comment below to connect with me on Social Media. Until then, here’s your Success in the Classroom! 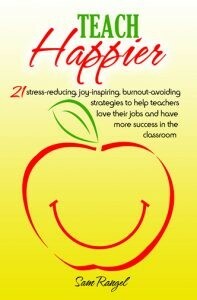 Don’t forget to check out my book, Teach Happier – 21 stress-reducing, joy-inspiring, burnout-avoiding strategies to help teachers love their jobs and have more success in the classroom. Get it from Amazon either in paperback or for your Kindle. Click Here!